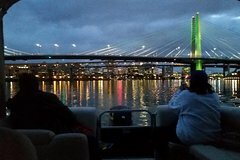 Classy pontoon boat tour by or through 10 bridges and around 4 islands! We depart in sight of the new Sellwood bridge, then cruise past the Iconic Oaks Amusment Park and by the oldest yacht club on the west coast then down the east side of East, HardTack and Ross Islands before going through Ross Island, Lighted Tillicum Crossing, Marquam, Hawthorne, Morrison, Burnside and Steel bridges where we catch a great view of the Golden Gate Red Broadway bridge, and the grand arches of the Freemont Bridge. We finish the tour with a cruise through Downtown and up the west side channel past the buried treasure of Toe Island and back to the dock. At night it is a similiar tour, but we linger to enjoy the city lights. Great tour for kids and visiting friends too! Open boat in nice weather and classy enclosure in cool or rainy weather makes "Party Scovare" the perfect platform for every party cruise! Hop aboard our comfortable "Party Scovare" pontoon boat for a fast tour by or through 10 bridges and around 4 islands! We depart in sight of the new Sellwood bridge, then cruise past the Iconic Oaks Amusment Park and by the oldest yacht club on the west coast then down the east side of East, HardTack and Ross Islands before going through Ross Island, Lighted Tillicum Crossing, Marquam, Hawthorne, Morrison, Burnside and Steel bridges where we catch a great view of the Golden Gate Red Broadway bridge, and the grand arches of the Freemont Bridge. We finish the tour with a cruise through Downtown and up the west side channel past the buried treasure of Toe Island and back to the dock. At night it is a similiar tour, but we linger to enjoy the city lights. Great tour for kids and visiting friends too! Open boat in nice weather and classy enclosure in cool or rainy weather makes "Party Scovare" the perfect platform for every party cruise! Please Note that 6 people are allowed on public cruises but Private tours for up to 12 people can be booked.